Omniscope's DataManager supports filtering of latitude/longitude points against geographic areas. For example, this could be used to filter all customers outside a sales catchment area. "UK major cities.csv" - A CSV file containing the locations of major cities in the United Kingdom. "English postal areas.kml" - A KML file containing the boundaries of all postal areas in England. Create a new file in Omniscope and go to DataManager. Drag "UK major cities.csv" and "English postal areas.kml" onto the DataManager workspace. In the "English postal areas.kml" block, next to "Overlay identifier", select "Name". This means that Omniscope will use the postal area names to uniquely identify postal area shapes in the data. Create a new "Geometric filter" operation. This block requires first a point dataset and second an area dataset to function. 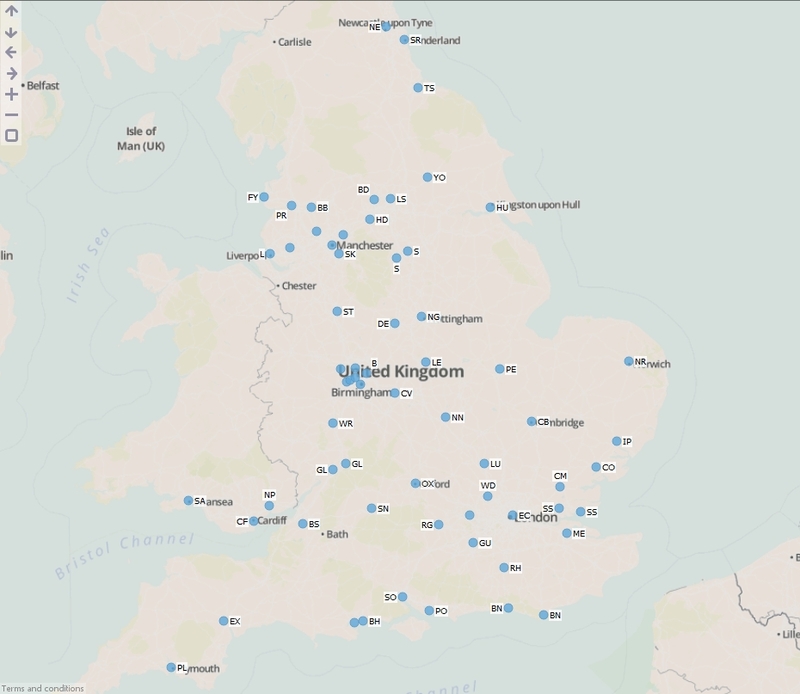 So connect the "UK major cities.csv", then the "English postal areas.kml" (please note that the point data must be connected first). All points (don't filter) - All points will be returned from the block. Use this in conjunction with 'Add "Areas" field' (see next step). Points inside any area - Keep only the points which fall inside at least one area shape. Points outside all areas - Keep only the points which do not fall inside any area shape. Check 'Add "Areas" field' to add a new field and merge the "Overlay identifier" from the Area dataset into your new Point dataset. In our example this will add the postal area codes from the "English postal areas.kml" into the new cities dataset. Execute the block, load the data into Omniscope and then drag a Map View into Omniscope to see the filtered point data. Overlay identifier - Field containing unique identifiers for each point or area in the input dataset, e.g. a field containing country names or postal area codes. Overlay sub-path indentifier - This is used internally within Omniscope to identify nested geometries within each shape. For example a shape for the United Kingdom could not be drawn with one continuous line. We use this field to breakdown the records into numerous islands which make up the country. Longitude - Field containing WGS84 longitude values. 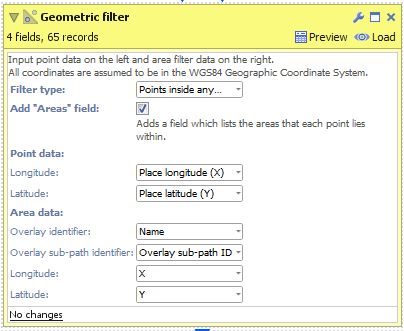 Latitude - Field containing WGS84 latitude values.